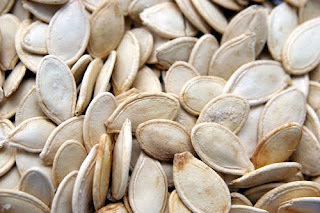 If you are wondering what to do with those pumpkin seeds leftover from Halloween pumpkin carving, or just thinking about making pumpkin pies, muffins, or cookies from scratch, try making your own pumpkin seed milk with the leftover seeds. Alternatively, most local health food stores and even our local grocery chain, Busch's, sell raw pumpkin seeds if harvesting your own seeds doesn't appeal to you. I have a bowl of seeds sitting in my refrigerator that I harvested last week and instead of roasting them, which is also yummy, I'm going to make a batch of pumpkin seed milk today. Pumpkin seed milk is very healthful and along the lines of almond or other nut milks. Pumpkin seeds boast very high levels of manganese, magnesium (the anti-stress mineral) and phosphorus among other minerals. They can reduce cholesterol, enhance immune response, decrease the risk of certain cancers, and reduce inflammation. Pumpkin milk is delicious and refreshing by itself, but can also be used in smoothies; most baking recipes in place of regular milk; or as a base for soups to impart a nice nutty flavor. Give it a try - I think you will like it! Refrigerate for a couple of hours. Filter through a nut milk bag or fine mesh filter to separate the pulp from the milk. Give the pulp a good squeeze at the end to get all the moisture out. Use right away and refrigerate any leftovers. It is normal for separation to occur - just stir it up before pouring and it will get creamy again. I love Raw pumpkin seed milk! Yum!! !